The Team: Mexico (aka “El Tri”) did not enjoy a very strong qualifying campaign. In fact, until they enjoyed a late run, they were pretty pedestrian. Plus, other than their recent strong performance in the Gold Cup Final, the US Nats have seemed to have their number (and it has been 2-0). 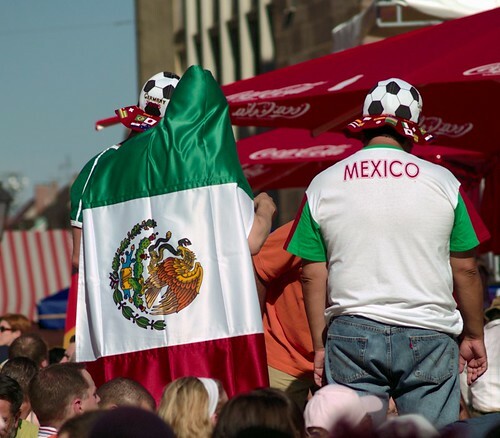 Mexico is proud when it comes to soccer, but they have only made it to the Round of 8 twice, and both times they lost even though the tourney was being played on home soil. The Cream: When a rational man considers who is the best of Mexico’s mercurial playmakers who will be featured during the 2010 World Cup, he must eventually decide that no Mexican man is more deadly with the ball at his feet than Giovani dos Santos. That kid can flat out play. Marquez can still shut down a striker or two, and Vela displays creative genius at least once a half. All in all, Mexico has the talent. The question is if they have the chemistry. The Dream: Obviously, Mexico is thrilled with their cakewalk draw and anything less than 2nd in Group A would be considered catastrophic. I don’t think they will get by their first knockout match though. I think their World Cup dream will quickly become a nightmare when their lack of defense is exposed by a truly dominant attacking side. I could be wrong (it wouldn’t be the first time), but I’d put the odds on Mexico to win the 2010 World Cup at 50:1.